Chamonix Down -10 is a warm sleeping bag designed for cold conditions ..
Test standard EN 13537:, 2012. The construction of chambers "H" prevents the loss of heat through the cold joints. The outer and inner space is anatomically shaped. 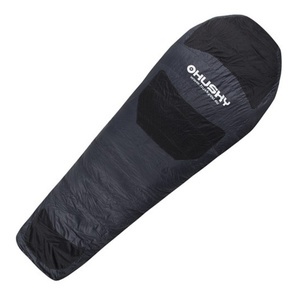 Sleeping bag has a 3D structure with side walls. They provide comfortable sleeping on their sides. 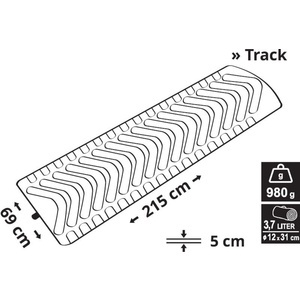 Sloping YKK zipper VISLON® affect the body during sleep on the side, and easier to handle. Gentle microfleece chin and overlapped top of the zipper. Two-way YKK zipper allows VISLON® opening and ventilation sleeping bag and bottom. Zip can open up and down the sleeping bag thoroughly ventilate and dry. The zipper is equipped with a safety bottom flap. which prevents unintentional opening completely. 2 3D double flaps along the zipper prevents heat loss. The lower part of the sleeping bag is shaped fins and thus provides a natural space for the legs in the supine position. whether for thick socks and insulated boots. Specially shaped bottom portion tapers from the knees to the ankles. 3D shaped collar is equipped with Velcro along the sides it can separate them. or combine into one unit. Moving the inner collar is split and allow to adjust separately the upper and lower part separately. 3D shape of the hood prevents migration of fluff and formation of cold joints. Peak on the hood improves weather resistance and prevents cold and condensed moisture from the tent, sleeping bag. It also prevents accidental contact with the walls of the tent. Side loading reduces the volume around the hood. thereby increasing the thermal efficiency. The sleeping bag you can sit or lie down without caps. Hood will not prevent the movement of the head during sleep. Moving outer hole is divided. which allows to adapt especially the upper and lower part separately. It is located inside. Spotters on the bottom of the sleeping bag for hanging. Inner zip pocket for an MP3 player. Mobil. GPS and the like. Supplied with a compression wrap and cotton wrap for storage. Spam protection: What is three times three?332?